This is my last card as GD for The Pear Tree Designs challenge blog. I have been asked to stay on as a proper team member and normally I would love the chance to be able to design for another team, but at the moment my day job will be taking up most of my time up until December and I don't think it would be fair to say yes and then not be able to give it my all and put myself under pressure. I am sorry I won't be with you girls - but I will still follow what you are doing and enter the challenges when I can. Thankyou for the opportunity of being with you. 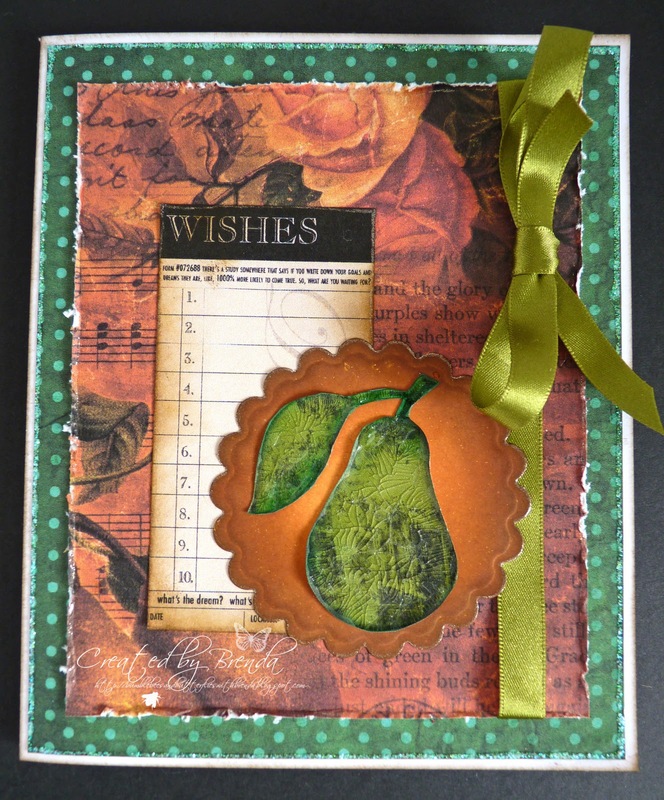 So the theme this week is autumn and I managed to get my card to fit in with both the challenge and the blog name - I used a pear which I downloaded and covered with crackle accents. I used nesties for the scalloped circle to back it on and DI rusty hinge and vintage photo. The wishes card is from 7 gypsies and the autumn backing paper was downloaded as well. The green dotty paper is from Summertime Designs and I changed the colour in PSE. The ribbon is from my stash. Hi Brenda, this is so stunning, love it, love it. dont work to hard, well at your day job anyway!! Hi Brenda. The colours are beautiful and I love the torn edges and the lime ribbon adds a fantastic splash of extra colour. Cute card Brenda and nice take on the pear. Congrats on being asked to join the team, even if work got in the way. Have a good one. Going out on a high note though, this card is just lovely B.
Hello Brenda. This is such a wonderful card. Love the design and all the different papers. Fabulous. Thank you for joining us at Tellens Place and hope to see you again soon. I love it! The crackled pear is gorgeous. Thanks for playing along with us at DDSB! Would suggest you access the Michaels web site and search for the most local store . . . then view the local stores offers and select print coupon before you head off!!! Yes, it really IS that simple! ENJOY - just got an MS round the corner set of punches for $12.50 or about EIGHT POUNDS!!! stunning Autumn card! Thanks so much for joining our Really Reasonable Ribbon challenge. A simple yet stunning card. Love the BPs. Hope work doesn't get in the way of your crafting time too much. I just love your card Brenda. Those rich Autumnal colours and lovely Pear stamp appeal to me so much. I have just picked the last Pears off the tree in my garden and now the leaves are turning Autumn colours your card reminds me of my own garden. Just perfect for our challenge this week at Kaboodledoodles. Thank you for playing along with our challnge and we hope you will join in next time. Great card!!! Thank you for joining our challenge at Digi Doodle Shop's Best! Such a beautiful card, Brenda - I'm loving your design! Thank you for playing along with us at Digi Doodle Shop's Best. what a lovely card you've made. Really like the crackle effect and the wish-list. The background paper with roses is just great! A great card! I love the pear and the layout of it! Try to find some time for crafting!! The distressing on this card looks fantastic...and I love that "wish" list. Thanks for joining in with The Town Scrapper challenge this week! Brenda, this is so beautiful. Wonderful design and colors. Great looking fall card! Stunning card dear, love the fall colours! Super great card ! Thanks for joining us at Digi Doodle Shops Best this week. Welcome again!! Great card thanks for joining us at Tellen's Place this week.